Just yesterday we saw an unknown Samsung device getting benchmarked sporting an Exynos 8890 chipset. The device in question was codenamed Lucky. According to a new report, this is in fact the codename for the Galaxy S7. Since 7 is considered a lucky number in many cultures, it's pretty obvious why Samsung chose to name its next flagship "Project Lucky" while it's in development. In an interesting twist, the Lucky was caught in another benchmark database today, this time rocking Qualcomm's Snapdragon 820 SoC. This is no surprise, as there have been rumors claiming Samsung is testing Qualcomm's next top of the line chip and hasn't yet decided whether to use it or not. Now it seems likely that the S820 will power at least certain versions of the Galaxy S7, probably the ones destined for the US (echoing what's been going on for most of the Galaxy S line's existence, except with the S6 this year). The prototype that went through the AnTuTu benchmark today came with a 5.7-inch QHD touchscreen, a 16 MP rear camera, a 5 MP front snapper, 4GB of RAM, and 64GB of internal storage. It ran Android 5.1.1 Lollipop at the time. So this is the bigger of the two rumored iterations for Samsung's next flagship. Qualcomm's chipset managed to beat out the Exynos 7420 as well as the Snapdragon 810 in single-threaded runs and in the 3D test. However, overall the Exynos 7420 still managed to come out on top of both of Qualcomm's contenders. Obviously though the Snapdragon 820 is still in development, so don't take these results too seriously yet. Just for fun, let's mention that Lucky's AnTuTu score was 65,775. 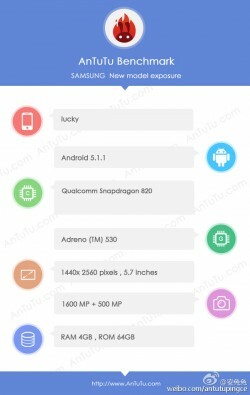 The final version of the Galaxy S7 may have a 20 MP ISOCELL camera instead of the 16 MP unit the prototype boasts. The S7 should keep the ultrafast UFS 2.0 storage of its predecessor, but Samsung is working on getting that to work with microSD cards. Currently the UFS 2.0 memory controller isn't compatible with expandable storage. Yet the Korean company might fix that by the time the S7 arrives on the market. It's definitely not a given, though, so don't get your hopes up that the Galaxy S7 will have microSD card support. I won't raise my hopes up on a MicroSD slot, a removable/replaceable battery, nor a 6GB RAM even but that Android 5.1.1 could just deter me from interest or purchase. Got marshmallow?